Use a penknife to cut or a lance to pierce the end of the cigar. Touch the flame directly to the foot of the cigar: Instead simply rotate it around the edge till it starts to burn, then puff lightly. 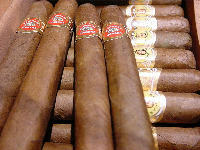 Ask someone else for a light ('The lighting of a cigar should be a personal affair'). Light your cigar too quickly or too slowly. Indulge in exhibitionism in lighting or any other aspect of smoking. Relight your cigar if less than one quarter of it is leaf. Put the cigar in your mouth to relight it. Just scrape off the ash and turn it in the flame for several seconds till it relights. Clench it between your teeth. Get the end of the cigar wet, chew It, slobber on it. Stick a toothpick or matchstick in the end of the cigar to help hold it in your mouth. Dunk your cigar in port or brandy, a habit attributed to Winston Churchill. Hold a cigar between your index and middle finger. Smoke more than half the cigar. Put the cigar out by crushing it in an ashtray. Warm the foot of the cigar slightly before starting to puff on it. Remove the band carefully after lighting the cigar. Take your time smoking it; a puff a minute is about right. Hold the cigar between your index finger and thumb. 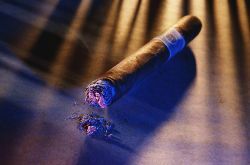 Let the cigar die a dignified death; after it's smoked halfway, it will go out on its own. Dispose of the dead cigar discreetly and quickly. Wait at least fifteen minutes between cigars; anything less indicates obsessive behaviour.